There are times in my life when I have to be dressed a bit more modestly. So whether that's wearing a shawl across my shoulders or some light trousers under my dress, I can definitely do it. 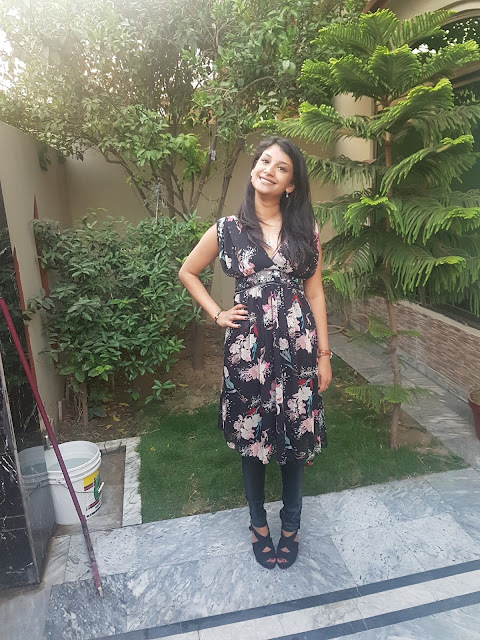 One such occasion recently popped up and it gave me the opportunity to wear this dress. It's a dress I've have had for a few years but have hardly ever worn, but I love the prints on it so I had to wear it. But turns out it's a bit tighter for me so did have to get help from my mum to take it off. I paired it with these trousers, which my aunt sewed for me, and also with a pair of New Look wedges. This dress is lovely, but I can see where there might not be as many occasions to wear it was you would hope for. Putting it over jeans is actually brilliant - and opens up all kinds of new possibilities for outfits! I LOVE the idea of wearing it over jeans!